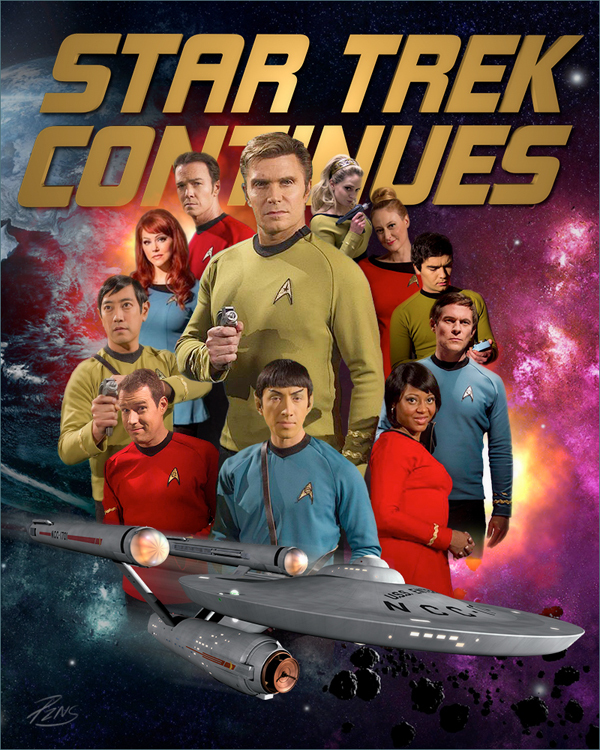 The complete HISTORY OF STAR TREK CONTINUES…in a single PDF! 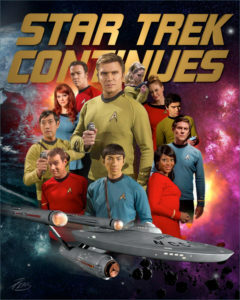 Just as STAR TREK CONTINUES was releasing their series finale last October, I was publishing an ambitious 6-part weekly blog feature covering the half-decade history of this beloved fan-made production. The blog series was, without a doubt, my most ambitious endeavor to date, researched and compiled from several dozen sources—articles, interviews, features, reviews, Facebook posts, updates from STC itself, and even video recorded live by yours truly. The six parts took me months to complete, and in the end, a few thousand people came to Fan Film Factor to enjoy reading about this fan series and the people who produced it. Is there any possibility that, when completed, you could make your work available as a complete downloadable entity? Man, did that sound like extra work! I politely declined, explaining that I was pretty busy writing new blogs. But then Bryan offered to create a PDF himself. He’d assemble all of the text, add the graphics, and even include and test all of the hyperlinks that I’d included in the original blog. Bryan got started in December and would send me versions to review every so often. We’d discuss designs and fonts choices; whether to use italics, bold, and/or ALL CAPS in certain places; where to place images and how large to make them, and whether to have the text by completely justified on the right or not. We troubleshooted bad hyperlinks, and Bryan even fixed some of my ultra-rare typos. It took a few months and a lot of hard work on Bryan’s part to get things perfect, but in the end, the finished product is something we’re both very proud of. SO big thanks to Bryan! In addition to the link below, I’ve also posted the PDF file to my new “PDFs” section here on Fan Film Factor. You can find that menu option in the middle of the top nav bar. Check it out, as there’s some other fun PDFs there for download as well. 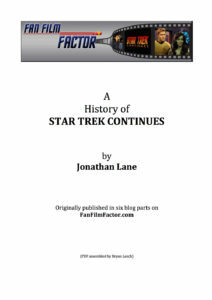 Click here to view the History of Star Trek Continues PDF. Given all of the many Star Trek fan films paying tribute to the original series, in my book, “Star Trek Continues” sets itself apart as a genuine part of Star Trek history. This PDF history is a great tribute to the series that ended way before it’s time. Well, technically, it ended two episodes before its time, Dan, which would have been another year or two at most. If you want to get extremely technical, STC should have been 26 episodes to completely match up with TOS’s yearly episode count. But now we are splitting the split hairs. If you are a true journalist, you would have fact checked the article. What a shame. Michael, what item did you have an issue with? For the record, I have reached out in the past to interview John Broughton to discuss Farragut. He was unable to find the time in his schedule (and I tried to set up something for a few months). I recently asked John if I could post his donor update on “Homecoming” to Fan Film Factor, and he said not to. So it’s not as though I haven’t been trying to fact check the stuff for STC that concerns Farragut for the Farragut perspective. If John or you want to post a comment and/or a correction, I’ll be happy to approve it here. Until then, though, the only source I have for my information is the 501(c)(3) non-profit filing made my Vic Mignogna and his team, and my assumption is that they wouldn’t lie on a government filing. That was the best I could do without cooperation on the part of the Farragut folks. I should mention, folks, That Michael is Michael Bednar, the person who supervised and did the lion’s share of the construction of a large portion of the STC sets when they were initially the Starship Farragut sets and, later, when the two productions shared the facility and built out new sets that hadn’t existed previously. I’ve covered the history of Starship Farragut in another blog. That blog is the one I’m referring to when I mention trying to set up an interview with show-runner John Broughton. Like the STC history, I was unable to get an interview with the production head and, therefore, had to do a lot more research into interviews, news articles, production updates, and even social media posts. Trust me, it’s LOTS easier to just do an interview…which I’m currently doing with Nick Cook of Star Trek: Intrepid and soon with be doing with Michael L. King of Starship Valiant. I would not rely too much on cooperation with Farragut Films, Jonathan. Having personally dealt with John and Michael in the past, the only form of communication you will ever get from them and anybody else from FF is a phaser bank full of rudeness and disrespect. Something that they have inherited from one of their writers. One Dennis Russell Putnam Bailey, himself. I would not waste time and energy on those people. It is not worth it. As far as I am concerned, terse and curt can be rudeness and disrespect concealed. As Khan once said, some people prefer things more honest and more open. Yeah, but I usually ignore it. I try to be nice and friendly and warm to everyone (except the detractors…and even most of them still get politeness and civility from me unless they go overboard with the venom). But for the rest of the folks out there, even John Broughton and (as you can see above) Michael Bednar, I answer their curtness with warmth and a smile. Michael, I just wanted to say that I enjoyed Starship Farragut at first. But after it went south after the incident with Starship Ajax and a few other issues, I did not enjoy it any longer. Too bad that Farragut Films blew it. You and John Broughton really had something good going. Too bad the two of you and others let fan politics and petty egos go to your collective heads. I really do try to stay out of the fan film politics when I can, Red. (Sometimes I get dragged in.) I personally enjoyed all of the Starship Farragut productions. If there was drama behind the scenes, so be it, but I was never aware of it. Hey Jonathan; thanks for the compliments, but I just saw it as something that needed to be done – your excellent work was too good and too significant for the Star Trek Fan Film community to run any risk of being lost. I had the time, so I sort of “…made it so”! A pleasure and a privilege. And by the way, congratulations on exceeding 500! Bryan/Jonathan thanks so much for putting this together. Excellent piece of work. Previous Previous post: My 500TH published blog!!!!! Next Next post: The TOP TWELVE new STAR TREK: DISCOVERY title sequences created by FANS!